9. No cable. Go to the library every Sunday to read! 23. Que apoyan a sus hijos con la lectura es muy importante. 35. No dejar que los niños se queden todo el día viendo tele. Busquen actividades para enriquecer sus habilidades. 41. Have fun. Read a lot. 47. Lo más importante es que ellos tengan actividades con otros niños, actividades variedad que no estén encerrados. 69. Animarlos a seguir estudiando durante el verano y buscar campamentos para ellos. Leer. 87. Enjoy every time with your kids. Have fun. 89. Enroll into summer camps reading programs be active in everything they do. 101. Keep them reading EVERDAY! 115. Disfrutar can los hijos cada día. To discover more fun and free or low-cost summer activities in your neighborhood, visit DallasCityofLearning.org and start exploring! From adversity to triumph: Rachel Dupard is living proof. The 21-year-old native of Duncanville now calls Santa Fe home. She’s a first semester senior at Santa Fe University of Art and Design as a Contemporary Music major. 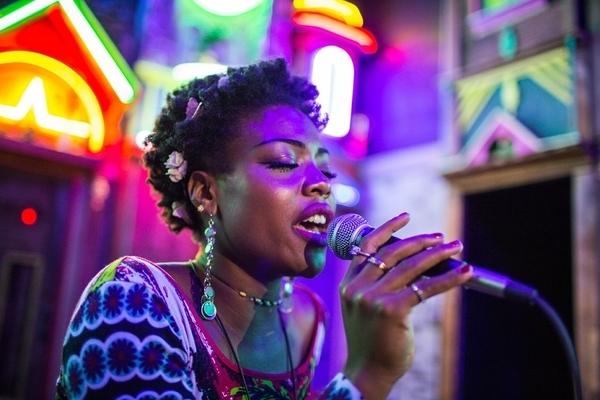 Dupard is a singer whose inner voice broke through a childhood hearing dysfunction. Her formative years in North Texas were impactful and revelatory, with more than a fair share of struggles, for the young lady born with fluid in her inner ear that complicated her hearing. Before she was in kindergarten, Dupard had already endured several surgeries and began three years of comprehensive speech therapy. But Dupard remembers the support of loving parents and the joy of singing. She remembers the heavenly noise of singing with her church and elementary school choirs. She remembers the impact Big Thought partner The Black Academy of Arts and Letters made in her journey via five years of rigorous summer programs and three years of master classes. TBAAL helped reinforce the foundation for Dupard’s singing dreams. She was in that potentially awkward teenage cusp during her first summer performance camp at TBAAL, a longtime Big Thought partner. It was 2008, and little did Dupard know how invaluable that experience would be. In fact, three years later Dupard was honored with TBAAL’s Curtis King Performing Arts Award. Dupard has studied classical through childhood private voice lessons, as well as gospel, R&B, and now jazz. She’s keenly aware of her talents, while at the same time accepting of the fact that her hearing history forces her to work harder to keep pace with classmates. But the passion burns, and Dupard has no regrets. She’s exactly where she needs to be thanks to parents, mentors and instructors that encouraged her to reach deep inside and nurture her gift. Adversity led to triumph. National Summer Learning Day comes but once a year. It’s July 14, to be exact. That’s the advocacy day designated by the National Summer Learning Association (NSLA) to “highlight the importance of keeping kids learning, safe and healthy every summer,” according to the NSLA website. But at Big Thought we celebrate Summer Learning Day throughout the entire season, not to mention the whole year, as we close the opportunity gap by providing children with fantastic, imagination-expanding chances to reach their full potential. Summer is ripe for that kind of nurturing motivation. We have Dallas City of Learning, a true public-private citywide commitment convened by both the City of Dallas and Dallas ISD, managed by Big Thought, and supported by a network of more than 200 community partners and organizations such as museums, libraries, parks, rec centers and neighborhood centers. Dallas City of Learning is up and running for a third year, so we are busy providing Turn Up! and Pop Up! events frequently tied to existing summer camps. Which brings us to the State Fair Experience Camp, which began July 12 and concludes July 14 – right on National Summer Learning Day. The camp, held at Fair Park’s Creative Arts Building, serves students from South Dallas that attend the various camps taking place in that area. Expected attendance for the three days is 150. 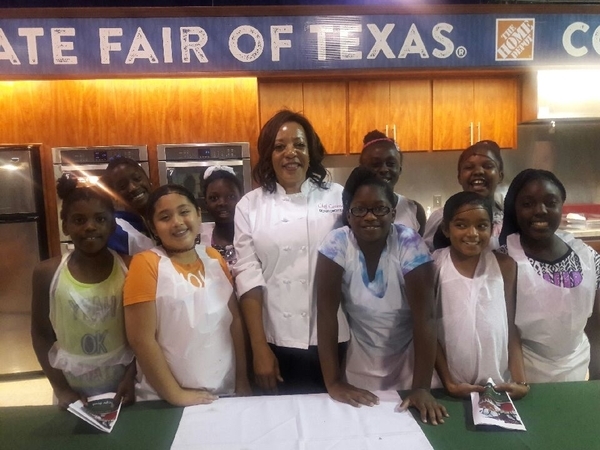 Day one of the State Fair Experience Camp included Chef Cassondra and the Diabetes Health and Wellness Institute cooking Strawberry Smash Muffins and Chicken and Guacamole Tostadas using the State Fair Competition Kitchen. Day two of the State Fair Experience Camp featured master gardener Jerry Robinson having students visit the Big Tex Urban Garden so they can learn about farming. He even had them plant their own seeds and take home the planters. The final day of the State Fair Experience Camp is all about creating arts and crafts. Yes, it’s the arty day. But it’s also the Dallas City of Learning Pop Up day. Big Thought ambassadors will be on hand with plenty of laptops to register students for DCoL, provide them with digital credentials for their hard work completing the State Fair Camp. We will have fun swag for the kiddos and lots of incentives to keep learning long after summer. 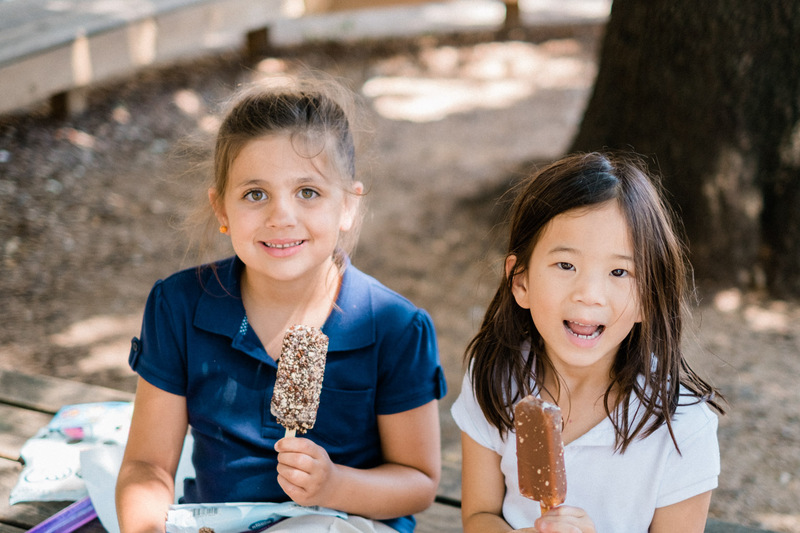 “By providing kids with fun, hands-on and explorative experiences they may not otherwise have, we ensure they avoid the summer slide that could leave them lost at the beginning of the new school year,” says Dove. Big Thought has more coming, too. DCoL’s second Turn Up! event happens July 23 at the Frontiers of Flight Museum in Dallas Love Field. The third and final Turn Up! event for 2016 is Aug. 4, a DCoL Tech Day at Billy Earl Dade Middle School in Dallas. Big Thought thanks its Dallas City of Learning donors for their incredibly generous support. For a full list of donors, please visit the Dallas City of Learning page. The day is unapologetically sunny, a gorgeous early summer vibrancy tamed by the canopy of trees lining Southern Methodist University’s Bishop Boulevard. There is brightness here; a glowing hue that charts a path like a lighthouse illuminates the way back for a wayward ship. Alonzo C., an 18-year-old student of Big Thought’s Creative Solutions program, sits on a couch lining the Owen Arts Center’s second floor. Below him are the Bob Hope and Margo Jones Theatres. 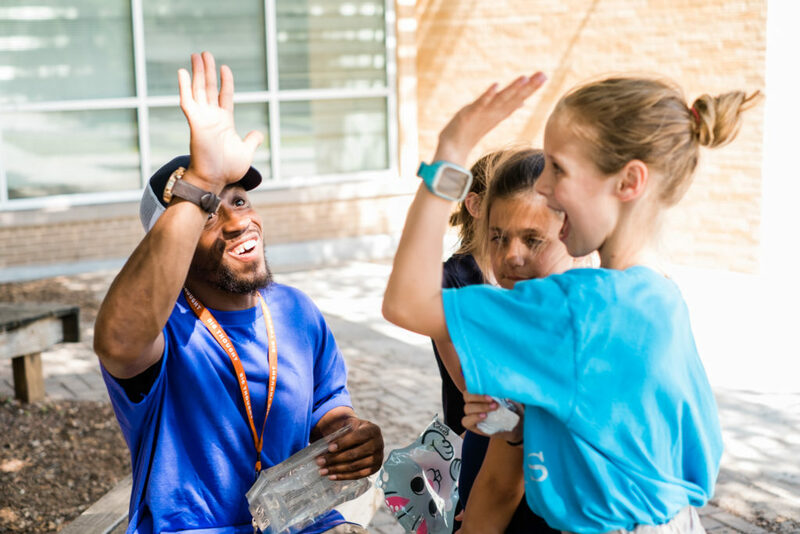 This is Alonzo’s fourth year in the Creative Solutions summer program at SMU’s Algur H. Meadows School of the Arts, a seven-week, arts-driven series of sessions that ends in a culminating performance July 28 and 29. Like most of the 12,000 students embraced by Creative Solutions since the program’s inception in 1994, Alonzo found his way back after being convicted of a crime and experiencing probation. Alonzo found his muse for singing, dancing and performing arts through Creative Solutions. He found his confidence. He found his empowerment. Alonzo now has a job, he stays out of trouble, and he can see a future. The Social Skills Improvement System (SSIS) analysis of the past two Creative Solutions summers revealed that 41 percent of youth increased their social skills by more than 5 percent, which is considered statistically significant. Also, 40 percent of youth decreased their problem behaviors score by more than 5 percent, also statistically significant. 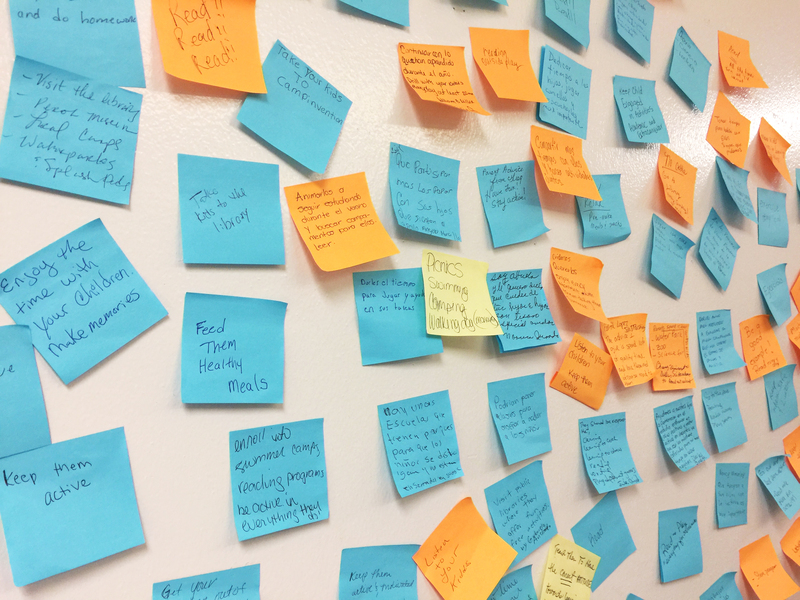 At the heart of that social-emotional learning is Big Thought’s Program Specialist Allison Caldwell, who in 2011 became Projects Director with Creative Solutions. Caldwell, who works day in and day out with the CS students, feels deep-rooted, emotional compassion for these kids whose lives have been anything but idyllic. These are kids stuck in a potentially widening opportunity gap. 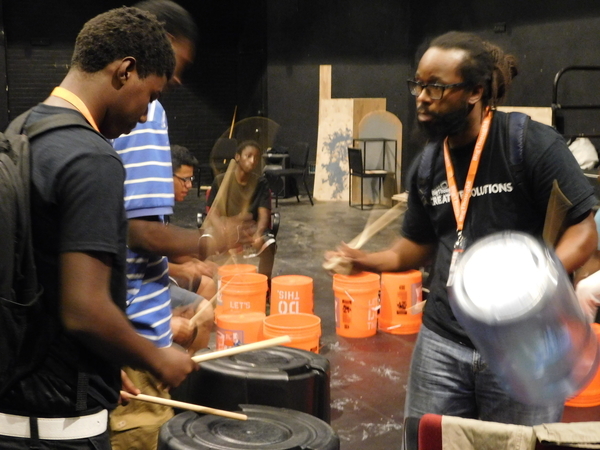 Caldwell counts on the character-building work of Creative Solutions teaching artists Alejandro Perez, Jr. and Menkiti Rice, both instrumentally involved in the CS summer program at SMU, to take these kids through a psychologically fortifying two months. How do those seven weeks go by? With singing, dancing, playing drums on water jugs and Home Depot buckets, writing poetry, doing calisthenics, chanting motivating mantras, making mosaic art pieces, sitting at the pottery wheel, working on your eye contact and posture, learning to shake hands with adults and mentors, finding the right words to express yourself, taking the time to solve conflict, being open-minded, seeing conflicts from other perspectives. It’s all about self-exploration, connecting with others through empathy, communication and collaboration, and self-regulation. Surviving morphs into prospering and the evolution begins. Sixteen-year-old David O. is back for a second year of Creative Solutions at SMU. His specialty is acting and creative writing, so that culminating performance at the end of July is paramount. He’s grown confident with singing and creative writing. He also has a summer job now that nourishes him with healthy responsibilities. And the lighthouse illuminates another path. Big Thought’s Creative Solutions thanks the Dallas County Juvenile Department, Dallas County Juror’s Fund, Southern Methodist University Meadows School of the Arts, Anonymous, ExxonMobil, Mr. and Mrs. David Chortek, Ms. Serena Simmons Connelly, Mr. Tom Connelly, Elizabeth Toon Charities, Hillcrest Foundation, The M.R. & Evelyn Hudson Foundation, Mr. Jay Judas, Texas Bar Foundation, The Junior League of Dallas, Katherine C. Carmody Charitable Trust, Ms. Eliza Solender, TurningPoint Foundation, Texas Commission on the Arts, National Endowment for the Arts, and The Ellen Wood Fund for their generous support.